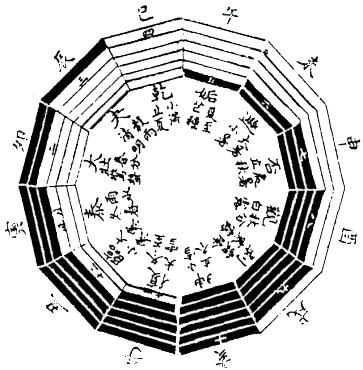 Tidal Gua, hexagrams of the moon or month, week and day. Animation: the white figure sees the hexagram 'growing'. The left one from midsummer to midwinter, the right one from midwinter to midsummer. In this website, "Chinese Fortune Calendar" the TaiJi symbol is explained. All lines dark at winter solstice. All lines bright at summer solstice. Three bright, three dark at spring and autumn equinox. The sun casts the shadow. In the course of one year, drawing a line along their lengths in a sun-dial (see also the animation above) creates a spiral. So the sun creates the TaiJi. The moon divides this spiral in 12 segments. Each quarter of the moon-month is one week, 7 days. The days of full moon, new moon and the two quarter moons are not fit for doing things. There is a much higher chance for accidents to happen, and the mind withdraws from labor, needs rest. So the natural sequence is: 6 week-days and a sunday. The moon creates the hexagrams out of the shadows of the sun.